Megacities are a new phenomenon in history. The fact that many of them are in emerging countries deepens the challenges of governing these spaces. Can these vast, complex entities, rife with inequalities and divisions, be governed effectively? For researchers, the answer has often been no. The approach developed in this work focuses on the material city and its institutions and shows that, without recourse to a big new theory, urban leaders have devised mechanisms of ordinary government. They have done so through the resolution of practical and essential problems: providing electricity, drinking water, sanitation, transportation. Three findings emerge from this book. Infrastructure networks help to structure cities and function as mechanisms of cohesion. Megacities become more governable if there is a legitimate authority capable of making choices. Finally, anarchic urbanisation has its roots in systems of land ownership, in inadequate urban planning and in the practices of developers and local actors. 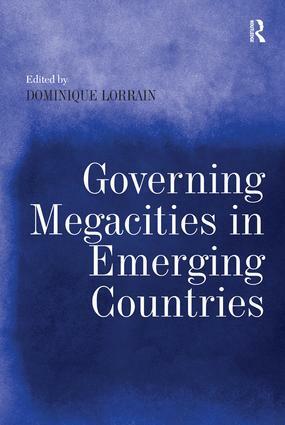 In the originality of its hypotheses and the precision of the analyses carried out in the four case study cities of Shanghai, Mumbai, Cape Town and Santiago de Chile, this work is addressed to all those interested in the life of cities: politicians, local and central government officials, executives in urban companies, researchers and students. Dominique Lorrain is director of research at CNRS, (Latts, Ecole des Ponts ParisTech). His research is focussed on transformations of urban public action and more specifically on infrastructure policies. He teaches at Ecole des Ponts, Paris and its joint MBA with Tongji University (Shanghai).